Here at The Album Room, there are plenty of options for the customization of your album. Our clients enjoy selecting the style and material of their album, while also making other fun additions. Take a look at the biggest trends at The Album Room. The Fusion is one of our more popular albums. It combines the look of both the matted and digital albums that we have to offer, which makes this unique option both contemporary and classic. Recently, more and more people have been interested in the matted albums. They have a more classic look, and our layouts allow for a sleek and intimate feel. While leather is a popular album cover choice, it is no longer the most common. Many albums are now being made with linen, buckram or silks. Embossing is another trendy way to customize your album. There are several fonts and colors to choose from. Stamping your designed initials, names, or even the date of your special day is a subtle yet personal touch to the cover. A flyleaf is an additional feature that allows a personal message to be written in the beginning of an album. Flyleafs are a heartwarming and stylish way for couples to express their love for one another. 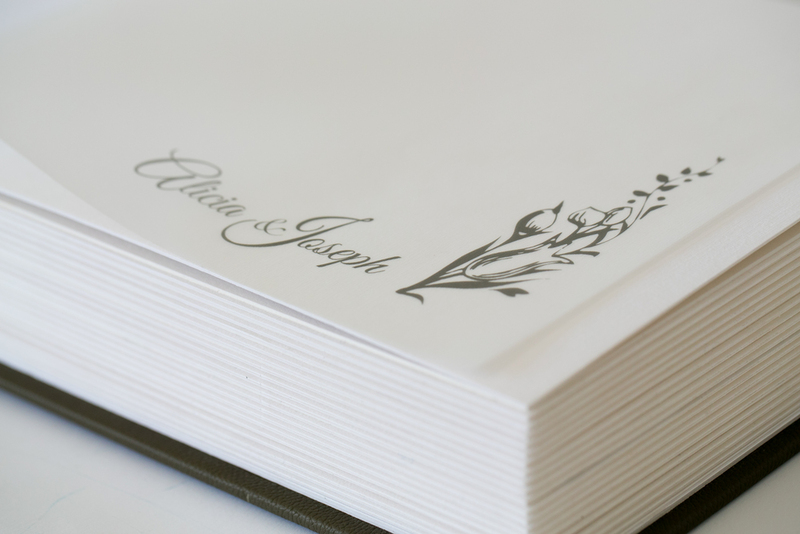 Pretty and personal - a perfect introduction to your wedding album. Text on images brings life to photos making them unforgettable. Take the personalization of your album to the next level by putting a line from the song of your first dance as husband and wife, or even a special quote from your vows. An invitation is one of the more personal touches a couple can add to an album, it is a cherished keepsake from that special time in your life. A lot of people like to get creative in designing their invitations, and The Album Room won’t let that go to waste! We can put the actual invitation directly into a page of the album, giving it a more personalized feel.